The Langham in Melbourne will offer another scrumptious High Tea event for kids over the 2016 / 2017 summer break. The Aria Bar at The Langham hosts children's themed High Tea events multiple times throughout the year, to coincide with school holidays. 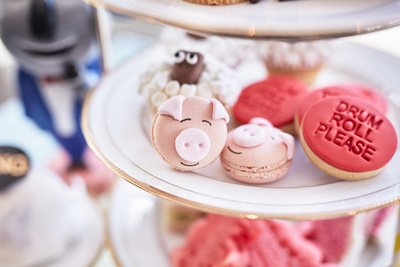 Over the years, the Langham has served up a multitude of quirky High Tea events for little people, guardians and parents. Popular sessions have seen Minions themed bananaaaa sticks, Scarlet Villain jelly and "It's so fluffy" fairy floss, aswell as Elmo macarons, Cookie Monster cupcakes, Big Bird popcorn in a cup and Bert banana heads in the Sesame Street Themed High Tea. The Langham has embraced the season's forthcoming movie blockbuster, with another fun High Tea to entice families into one of Melbourne's most luxurious restaurants on Southbank. This summer's sweet-toothed subject matter is the animated movie SING, which is released in cinemas on Boxing Day. SING the movie, by the same creators of much loved kids titles Despicable Me, Dr Seuss’ The Lorax and Despicable Me 2, includes a star-studded cast including Matthew McConaughey, Reese Witherspoon, Seth MacFarlane and Scarlett Johannson. The movie features anthropomorphic animals such as a koala called Buster Moon (McConaughey), an overworked pig named Rosita (Witherspoon), an arrogant white mouse named Mike (MacFarlane) and a punk-rock porcupine named Ash (Johansson). The Langham's signature cucumber ribbon sandwiches, fairy bread, freshly baked scones served with fresh cream and jam, hot chocolate and red cordial. 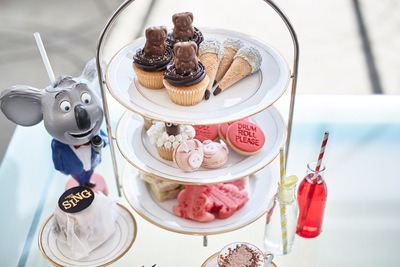 As accompanying adults, you get to enjoy The Langham Melbourne’s enjoyable Afternoon Tea with Wedgwood at the same time as your children enjoy all things SING. When: Every week day at 10am until 11.30am and 12.30pm until 2pm, from 28 December 2016 to 31 January 2017. Book: via ariabar.com.au or call 1800 641107. Note: Children are encouraged (not compulsory) to dress up as their favourite animal to embrace the theme of the event.